REN FLASH HYDRO-BOOST Instant plumping emulsion 40ml is a hydrating and plumping facial cream to prevent the ageing effects of dehydration. A efficient emulsion that locks in moisture and plumps up the skin for a fuller appearance. Supercharged with water, this caressing emulsion infuses the skin with instant care by both drawing in and locking in moisture. Firstly, water is circulated throughout the skin using peptides for a smoother, fresher appearance. Then, water is locked in thanks to Hyaluronic Acid, which plumps skin from within. Germ Peptide supports circulation for hydration that reaches through all layers of the skin. The sugar extract Xylitol converts surface moisture into natural hydrating structures. Extracted from Soy beans, Phospholipids combines with Ceramide from Carthame Oil to form a layer around the skin that keeps in moisture to reduce dehydration. Active Ingredients: Shea Butter, Rice Bran Oil, Rice Germ Oil, Hyaluronic Acid, Soy Extract. Hydrating and Plumping Anti-Ageing Facial Serum. 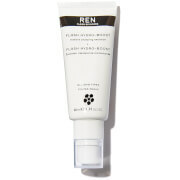 REN Clean Skincare Face Flash Hydro-Boost Instant Plumping Emulsion 40ml / 1.3 fl.oz. REN FLASH HYDRO-BOOST Instant plumping emulsion 40ml was found on 5 websites and was price compared using EAN: 5060389243769. The cheapest REN FLASH HYDRO-BOOST Instant plumping emulsion 40ml is shown as the main item, prices range from £26.95 to £36.00, excluding delivery. Price comparison based on price and delivery charges, with any valid discount codes being applied, is shown in the table above. Prices and information correct at the time of publication.